Yumist tasty, home style and affordable meal in Gurgaon, South Delhi and Noida. Yumist is a food tech company that delivers delicious, homely meals on demand. 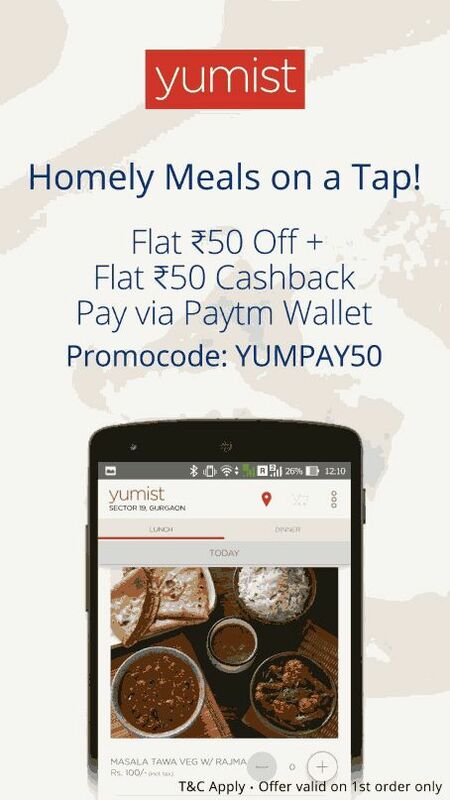 Now in association with PayTM, Yumist has come up with offer for new users where they giving flat Rs. 50 discount + Rs. 50 PayTM cashback When you pay via Paytm Wallet & Also Main thing is No minimum order require to Avail this Offer! How to get Yumist 1st Food Order at 50 Rs Off + 50 Rs Cashback on Paytm ? • Add order to cart as usual > Proceed > Select address > on step payment in coupon code box add coupon YUMPAY50 and click red tick button > Select Delivery time > Pay via Paytm to Get 50 Rs Off + 50 Rs Cashback. - Offer valid from 23th June 12:00 PM, 2016 to 7th July, 2016 or until stocks last before the valid date.